That is, unless real change comes to the economy, and fast. Climate change poses a more dire threats to the millennial generation than rising seas do to their parents’ basement. Two troubling social trends are converging on the horizon, which could bring either promise or peril, depending on the next generation’s ability to restructure the economy. According to an analysis by the think tank Demos and liberal advocacy group Next Gen, as climate change drives ecological turmoil in the coming years, long-term economic stagnation drives social despair, and both demand systemic change driven by youth. A median-income worker who graduated college last year, according to Demos, is set to “lose over $126,000 in income over her lifetime, and $187,000 in wealth if the income were to be saved and invested,” if policymakers do nothing to deal with climate change. This compounds other economic woes dragging down millennials, including unraveling social safety-net programs, debt and unsustainable childcare costs—amounting to a maelstrom of recession-induced lifetime losses that have totaled about $112,000 for a typical college-educated young worker’s household. Altogether, without action on climate change, Demos projects a loss of $8.8 trillion in the lifetime income of the rising generation—vastly overshadowing even the $1 trillion student-debt crisis. Both millennials and their parents are already bearing the costs, as tax costs linked to climate disruptions have amounted to an estimated $10 billion annually for the past eight years. Like climate change, economic decline hits vulnerable populations harder. Blacks and Latinos, who are especially prone to high debt burdens, are also especially at risk of dropping out before attaining a degree, leaving them with worse job prospects. In contrast to the relative boom times their parents enjoyed, Demos notes, “the median wealth of young households with a bachelor’s degree or higher declined by 24 percent over the past quarter century,” while the debt burden of college-educated households soared by nearly 50 percent. All these financial stressors, however, are dwarfed by the looming threat of a warming planet. The hazards include more frequent and intense extreme weather events, disease outbreaks, and farm yields gradually deteriorating due to various climate-related disturbances like soil changes, pests, drought, or flooding. Acute impacts of climate change will hit fast-growing vulnerable areas of the country, such as the flood-prone Gulf Coast. And even huge cities like New York are increasingly exposed to disasters like Superstorm Sandy, which intersected lethally with vulnerable urban infrastructure and entrenched urban inequality. Blacks and Latinos have always suffered environmental injustice through both economic and public-health impacts. Lew Daly of Demos says via e-mail: “The costs of extreme weather and other discrete impacts of climate change, such as heat-related health problems, will undoubtedly be borne most heavily by people of color who live in less climate-resilient communities and suffer the most exposure to the toxicity of the fossil fuel economy.” Rising temperatures will bring more catastrophes like Hurricane Katrina, which devastated the poor black communities of the Gulf Coast. While climate change is an existential threat, if enough political will is generated to combat it, it also has the potential to be a source of innovation and social transition. Demos projects that the negative impacts of both climate change and the general economic stagnation facing the millennial generation could be countered by implementing new technologies, production systems and conservation measures. According to Daly, if investments made in accordance with the strategies established in the Paris climate treaty—which imposes a long-term cap on global temperature rise at 2 degrees Celsius above preindustrial levels—the country would see “net positive job gains and other economic benefits compared to a scenario” in which policymakers take no action. The investments in green energy would doubly benefit millennials, because they are primed to take advantage of opportunities in expanding sectors, including renewable power generation and installation and environmentally focused infrastructure innovations. These investments bring much-needed career-track jobs to the economy, which could be a boon for youth who are today forced to work part-time low-wage gigs to scrape by. On the consumer side, poor black and Latino communities would especially benefit from energy retrofitting and transitional training programs to link disadvantaged workers to green-energy jobs. The cross-cutting approach of a “just transition”—a social welfare–focused approach promoted by groups like Green for All and Apollo Alliance—would combine infrastructural investments, subsidies, and education to ensure social equity. 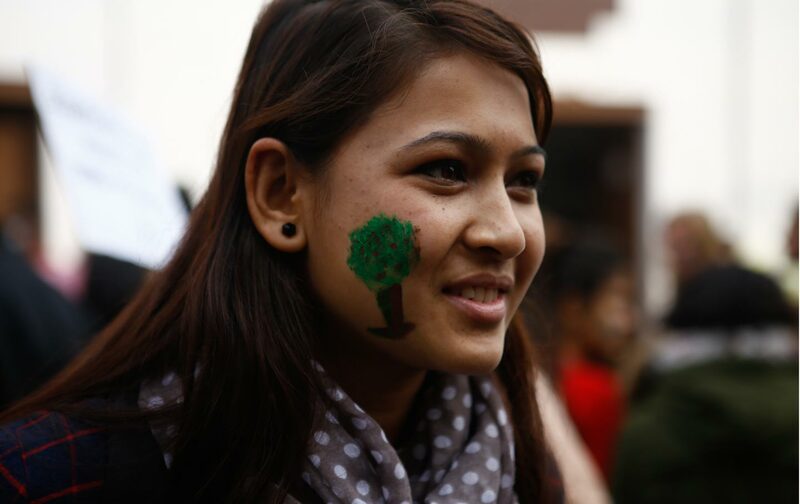 The just-transition concept is driving the grassroots climate movement on the international level as well, engaging labor, community, and indigenous organizations to design alternatives to a carbon economy, while protecting vulnerable groups. Both the environment and economy suffer from climate change, but they improve together when policymakers make a concerted effort to change modes of production. It’s the older generation, not millennials, that has done the most harm with decades of short-term thinking. After all, older people are currently driving the climate problem as well as failing to enact effective climate policy. The millennials struggling with economic precarity today are also best positioned to turn the disaster around tomorrow. It all hinges, though, on whether the aging generation will finally yield power to young people and let them start cleaning up the mess they’ve been handed.